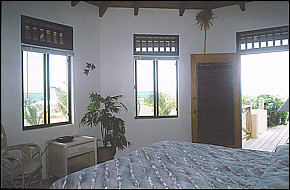 Shoys Paradise Found was designed by an architect to take advantage of the balmy breezes of the refreshing trade winds with cross ventilation in every room. 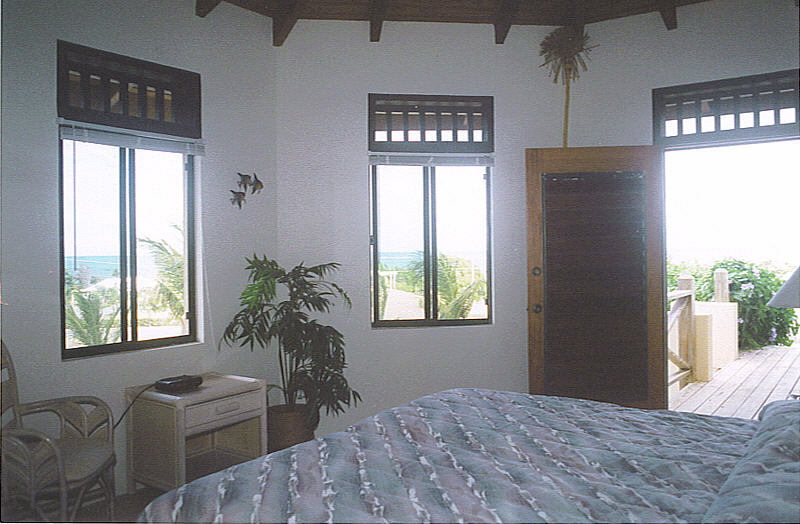 Two separate bedroom wings on either side of the great room allow for both privacy and togetherness. The extensive deck that wraps around the entire front of the villa allows each guest to choose sun or shade at any time of the day while enjoying the panoramic view of the ocean, Buck Island and the Green Cay Marina. 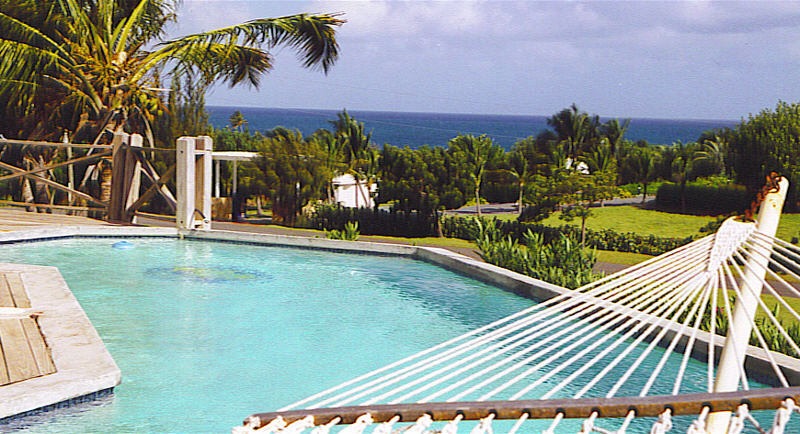 Our 36 foot long pool is great for a swim, but is also a focal point for relaxing in the hammock or chaise lounge, dining al fresco at the outdoor dining table with barbecue grill, or gazing endlessly at the fabulous views. 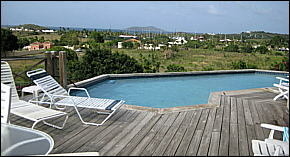 Buck Island and the beautiful Caribbean Sea can be seen from any of the North facing windows and the pool deck. 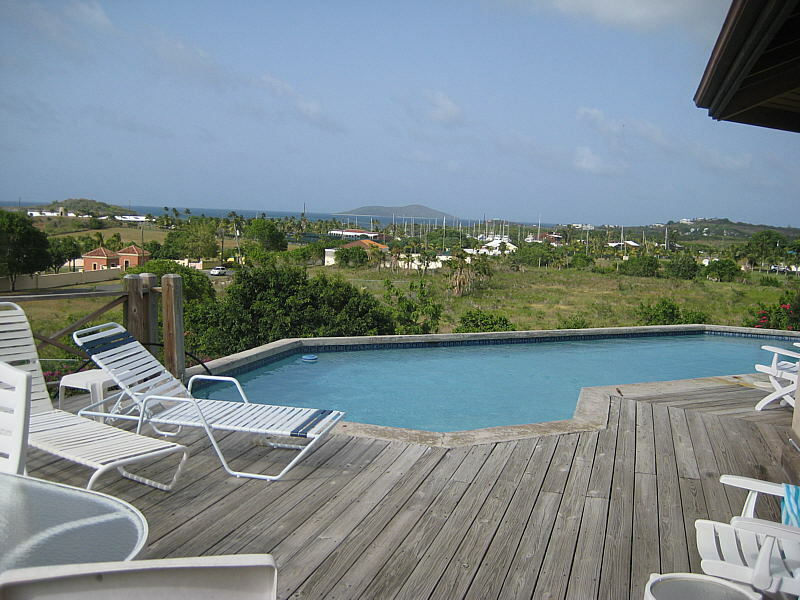 Beautiful views, beautiful beach, beautiful villa, beautiful Caribbean island. This is truly Paradise Found! Come and see for yourself. 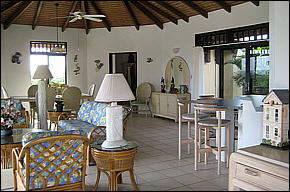 The great room with its high West Indies style ceiling includes a living area, dining area, and a fully equipped kitchen with large windows and glass sliders all around. 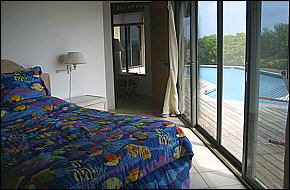 The master bedroom suite (left) features a Queen bed, dressing area, bath with "open air" shower, and a den with a futon. You can walk right out to the pool in 3 steps. The other bedrooms in separate wing share a second bathroom that even has a bathtub - very unusual in the Virgin Islands. 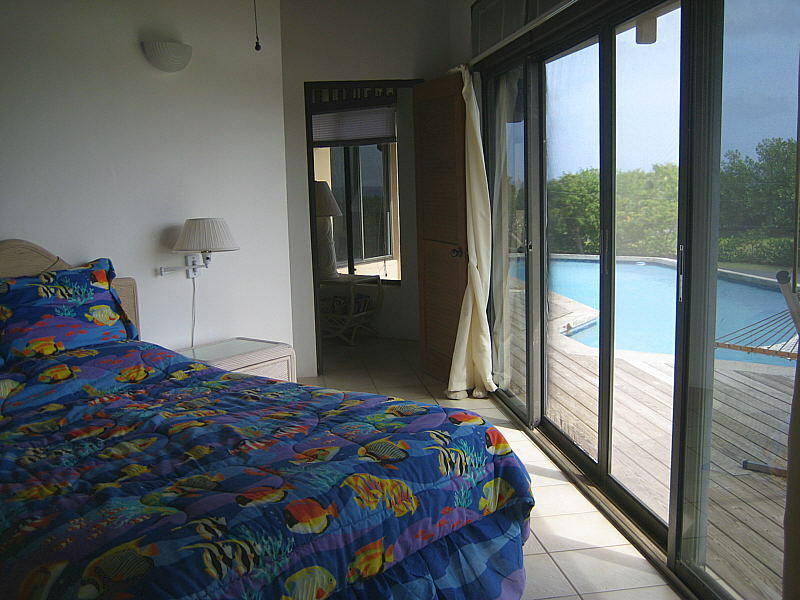 One of these bedrooms has 2 twin beds, while the other has a King bed, and also its own entrance out to the deck. There is also a caretaker apartment on the premises. We would very much like to speak with you on the telephone to point out special attractions and services available on St. Croix, and to explain in detail the amenities of our villa. The villa sleeps four to seven people. Rental rates are on the contact page. We hope that you will make Shoys Paradise Found your vacation destination. 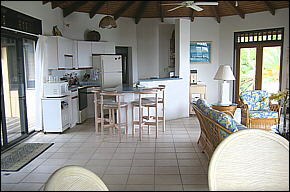 We are sure you will come to understand and appreciate our love of the island and Shoys Beach. 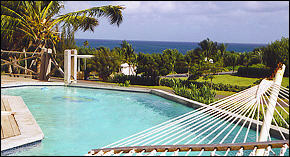 Enjoy St. Croix! Contact us today!